Don’t be tempted to rush through the most important part of a kitchen remodeling project. 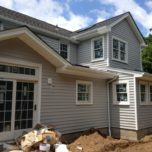 NJ homeowners are very busy with their own lives and have little time to waste, the allure of jumping right into the kitchen remodeling project seems like a good idea at first since it get things moving ASAP, the trouble comes later on when decisions need to made and everything starts to pile up. Planning your kitchen remodeling project takes time, but it also saves time, much more than the time spent planning. How is this possible you might ask? Proper planning increases efficiency during the kitchen remodeling construction phases. Having everything ready to go will allow everyone involved to do their part without waiting for selections/direction. Create a kitchen remodeling checklist by writing out a detailed list of what the kitchen remodeling project will include. Then start looking for kitchen remodeling contractors, plumbers, electricians, tile installers, countertop fabricators, etc for each of the items you have listed. Another benefit to planning your kitchen remodeling project, as discussed above, is it helps you to stay on budget because you have a better understanding of the entire scope of work. Plumbing changes that involve moving the kitchen sink are going to add some big bucks to the kitchen remodeling budget so if you can avoid the move that money can be put to good use in areas that are more appreciated. A creative kitchen designer can transform your current space into your dream kitchen with just the right products and services that only “look” like you’ve spent $100,000. Do as much research as possible on every item you will need. Doing this will allow you to understand how these items look, feel and function. Making these decisions at your leisure provides the opportunity to digest all the information. Once the kitchen remodeling work begins you will feel pressured and rushed to make decisions and may potentially regret a few. First you’ll want to check if the contractor is licensed in NJ. Kitchen remodeling contractors are required to do so and must also carry insurance in accordance with the NJ home improvement contractor act. Then take a look at their online presence outside of their own website. Their social media presence is a very important indicator of how happy their clients are. The more positive online reviews the better, never take their word for it. Look for a kitchen remodeling contractor that will take you shopping and help select the materials for the project so you are sure everything is going to work well together, don’t get fooled into doing all the work yourself. The kitchen remodeling contractor should also be neat, prompt and responsive right from the start. If they can’t even show up for the first appointment on time or get back to you in a reasonable time with the estimate, how do you think the rest of your kitchen remodeling job will go? Need help with your Kitchen Remodeling Project? Find out more here. Make plenty of meals that can be easily reheated during the kitchen renovation. Not having a kitchen for a few weeks can be very difficult. Setting up a temporary kitchen using your old kitchen cabinets and countertops will make it somewhat tolerable. Start cleaning out the adjacent room to make way for all the work that is about to happen. It’s not 100% necessary but it makes the whole kitchen remodeling project run a lot smoother having the additional space to store items like cabinets and plumbing parts in addition to cutting of materials. Setting up temporary alarm codes and garage codes for the kitchen remodeling contractors to use for the duration of their work will provide access and keep things secure. Get a copy of your home keys made to put in a lock box. Write out a complete list of contact information in case of an emergency during the kitchen remodeling project. Notify your homeowners insurance about your kitchen remodeling plans to make sure that your insurance covers the contents that are being stored at your home, namely contractors tools, appliances and cabinets that are yet to be installed against theft and to what value, an increase in this coverage may be necessary. Believe it or not, kitchen remodeling can be fun and enjoyable if proper planning has taken place. Sure there will be some hiccups along the way but being prepared for them means it will not create an obstacle that will slow you down because you will be ready for it. Partnering with a kitchen remodeling contractor that you get along with goes a long way when you are working together for weeks on end, nothing’s worse than having a personality conflict with a contractor. If you don’t care for them in the beginning, chances are you’re not going to feel any different in the end. Still Have Questions? No worries, Give Us A Call At 973-636-0100. Deciding on which kitchen cabinets to put in your kitchen is a very important decision, it’s a large investment and will most like be the largest single expense you will have when you are updating your kitchen. That being said, it is reasonable to think the kitchen cabinets will fit the space they are intended for, but they also need to fit your lifestyle, meaning, the combination of available door styles and cabinet finishes really need to capture who you are and set the right tone for your home. The accessories and options need to meet your families food preparation and storage needs. Last but not least, the kitchen cabinets have to fit within your given budget. 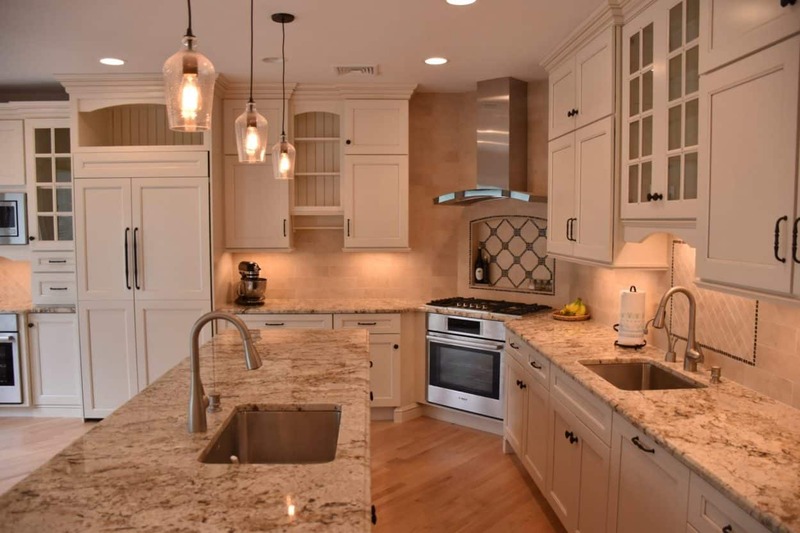 Kitchen cabinets are produced at several price points with varying construction types/options by many different manufactures in and around NJ and even more within the United States. The better quality brands will stand out with a lifetime warranty, giving you a little more peace of mind knowing your kitchen cabinet purchase and investment will be safe for years to come. The difference between your kitchen cabinets lasting a few years or a few decades is largely attributed to the way in which they have been constructed and assembled. Have you ever purchased a cheap set of utensils like forks, spoons and knives, and after a year or two you have about two of each left? The same can be said for inexpensive kitchen cabinets except they are not that cheap or easily replaced. Kitchen cabinets made of solid wood face frames, all plywood cabinets boxes and solid wood dovetail drawer boxes have the best chance of standing the test of time in your kitchen. How the components are manufactured and assembled will also determine how long the kitchen cabinets will last. Look for components that are fitted into one another using wood joinery techniques like dados and rabbeting that are glued and fastened together. The overall appearance should be neat and clean reflecting a pride in craftsmanship. The best door hinges and drawer glides are made by Blum or Grass and have their own lifetime warranty, there are plenty of imitations out there so don’t hesitate to ask – most premature cabinet failures are due to poor quality hardware. At some point during the planning of your kitchen cabinets you will be asked if you are looking for inset or overlay cabinets. inset kitchen cabinets refer to the door and drawers of the kitchen cabinets that are recessed into the face frame of the cabinet. The advantages of this style are: clean look, very traditional and very much a furniture like detail. Disadvantages of this style are: less interior cabinet space, costs more to do since it’s a custom feature and reduced drawer head sizes means less room for drawer hardware. Overlay kitchen cabinets refers to the doors and drawers of the kitchen cabinet that sit over the frame of the cabinet. This style of kitchen cabinets are the most popular and are are widely produced as stock, semi-custom or custom kitchen cabinets providing the most price point options available. Inset kitchen cabinets are typically produced by custom cabinet manufacturers with higher quality standards, on the other hand, overlay kitchen cabinets are made by all sorts of manufactures, each having their own quality standards so pay close attention to the details. Selecting the right accessories for your new kitchen cabinets can help you utilize the cabinets to their fullest potential. Kitchen cabinets with roll out shelves is number one on my list – the addition of these rollout shelves allows you to reference the goods all the way at the back of the cabinet just by pulling out the shelf. Double can roll out trash would be second on my list – mainly because it can be placed in the most convenient place for the user and does not take up any additional space in the kitchen. Cooking utensils and cutlery storage drawers would be next followed by spice storage that can either be as a pullout next to the range or on stepped shelves in the bottom of a upper cabinet next tot the range. From there the accessories and options can be tailored to the users specific needs. One word of advice would be to stay away from accessories that over complicate things, the goal is to improve the overall user experience and use of the kitchen cabinets. If you have an existing kitchen and you’re looking to update the functionality, take a look at some aftermarket kitchen cabinet accessory manufacturers like Rev-A-Shelf and Hafele. They both offer a wide variety of cabinet organizational options. Hafele also carries decorative kitchen cabinet hardware. Need help planning all the Kitchen Cabinet details? Contact Us Today To Get Started! Take your kitchen cabinets to the next level with the addition of furniture details, here are a few examples and ideas; furniture base molding on island cabinets, adding cabinet door panels to the open ends of upper cabinets and lower cabinets, multiple piece crown moldings, support countertop overhangs with either a decorative bracket/corbel or a turned/carved newel post. While most of the options sound very traditional many kitchen cabinet manufactures have adopted a wide array of complementary components to be used in more transitional and contemporary styles. On the converse, furniture details for kitchen cabinets does not have to mean the addition of the above mentioned components, true furniture details can be found at the beginning of the process in the kitchen design plans in the form of how the different components are married together to create a set of kitchen cabinets that appear to all be made as one piece with clean lines and mounding that tie every together. Achieving this level of detail may be difficult using stock cabinets but it is certainly possible with semi custom kitchen cabinets and if your budget allows for it, custom kitchen cabinets will allow for the most flexibility in terms of how you can add your own personal taste to the furniture details. To make this decision you should start by taking a look st your kitchen cabinet design plans elevations, this is the front view of your kitchen cabinets as they will appear on the walls of your kitchen. Survey the plans to gather an understanding of the various sizes of cabinets that make up the design. Now keep this in mind as you are looking at the kitchen cabinet door styles, you’ll want to make sure the that the door style works as well for the largest cabinets and the smallest cabinets, in particular would be the narrow cabinets. It may even be possible that the kitchen design plan will need to be tweaked to accommodate a particular door style you have chosen. The next consideration would be for the decorative hardware that will get mounted to the various kitchen cabinets doors and drawers – some kitchen cabinet doors and drawers have either raised or recessed panels that create an opportunity or an issue depending on which decorative hardware is selected, looking ahead at this selection will help guide you in the right direction. The final consideration is how will the kitchen cabinet stain or painted finish look on the door/drawers. 20 Page Kitchen Cabinet Door & Details Brochure – Download Now! The decision to go with either a painted kitchen cabinet finish or a stained kitchen cabinet finish is subjective, and although there is a big difference between the two in terms of appearance, both are equally as durable. The reason this is the case is because after the kitchen cabinets are either painted or stained, they received a top coat of clear, durable conversion varnish or similar coating that locks down the previous coating and protects from everyday use, without this final step your kitchen cabinets would show signs of wear very prematurely causing an unsightly appearance followed by additional damage. 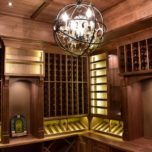 Some other kitchen cabinet finishes that are not so mainstream include; the use of reactive agents that tan the wood and bring out the natural characteristics, flaming the wood with the use of a torch to blacken the wood then removing the heaviest and softest parts on the surface by using a wire brush, the end result yields a very aged appearance. 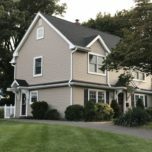 The application of glazes and dyes are another way to achieve an aged or weathered look and even an antique look using the same materials and varying the application process. Deciding to purchase new kitchen cabinets is major financial commitment, having a good manufactures warranty will help give you peace of mind knowing your investment is protected. Look for kitchen cabinet warranties that cover the product for as long as you own it. This will be advertised as a “Lifetime Warranty” or more accurately as a “Limited Lifetime Warranty”. The best warranties will include full replacement of any defective parts/components with very few exceptions. Typically the single largest exclusion is damage caused by water, this may seem counter-intuitive but it is totally the norm for kitchen cabinet warranties. 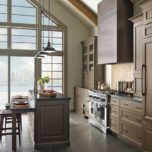 Another common exclusion is the labor associated with the defective parts/components replacement, this is where the kitchen cabinet installer’s company comes into play, it’s a good idea to review these terms with the kitchen installer and how they typically handle these types of kitchen cabinet warranty repairs. Verify that your kitchen cabinet installer will follow all manufacturer’s written installation instructions is the best way to ensure you do not void all or part of your warranty should a shoddy installation take place. No Worries, give us a call at 973-636-0100. Do I need more countertop space? Do I need more kitchen cabinets? Are my kitchen appliances sufficient to serve my needs? Your answers to the above questions are an outline of what you need out of the space, the next step is to prioritize those items with the most important on top. Depending on your requirements and the actual space, you may not be able to simply achieve a better kitchen design without having to sacrifice moving a window, extending a wall or even removing an entire wall. It also may not be so obvious to you as to where these opportunities can be found within your existing space, starting with a blank room and paper is the best way to get around the visual obstacles that you see looking at the existing kitchen. A kitchen design floor plan shows the wall layout from an overhead view with the outline of the components that will fill the space such as: base cabinets, upper cabinets, kitchen pantry and appliances. Start by drawing an outline of the rooms shape, then note door and window openings and any other obstacles. Bergen County NJ Kitchen Designs have no shortages of openings or obstacles! Then note the given measurements starting in the lower left-hand corner of the room working clockwise around the room until you are complete. When measuring the door trim you want to measure to the edge of the trim to the corner of the wall noting the available wall space. Take note of the existing centerline and locations for the plumbing and appliances, this is very helpful when it comes to deciding what to move. Next you can take these rough sketches and convert them into a cleaner kitchen design floor plan to use for your kitchen design layouts. It’s a good idea to make photocopies of the blank plan so you can create several renditions of your kitchen design. Start by laying out the sink, range and fridge followed by the must-have items in their preferred locations in the kitchen, then fill in the remaining areas with other cabinet configurations of your preference. Need help with your Kitchen Design? Arrange for a FREE Kitchen Design consult today! Counter depth refrigerator – this term refers to a refrigerator that has been specially made where the box portion measures the same depth as a kitchen base cabinet, 24” deep. This comes in very handy when you do not have extra space to give up for a standard depth refrigerator in your kitchen design. Slide-in range – this term refers to a range/stove that does not have a back on it like a traditional range/stove has. 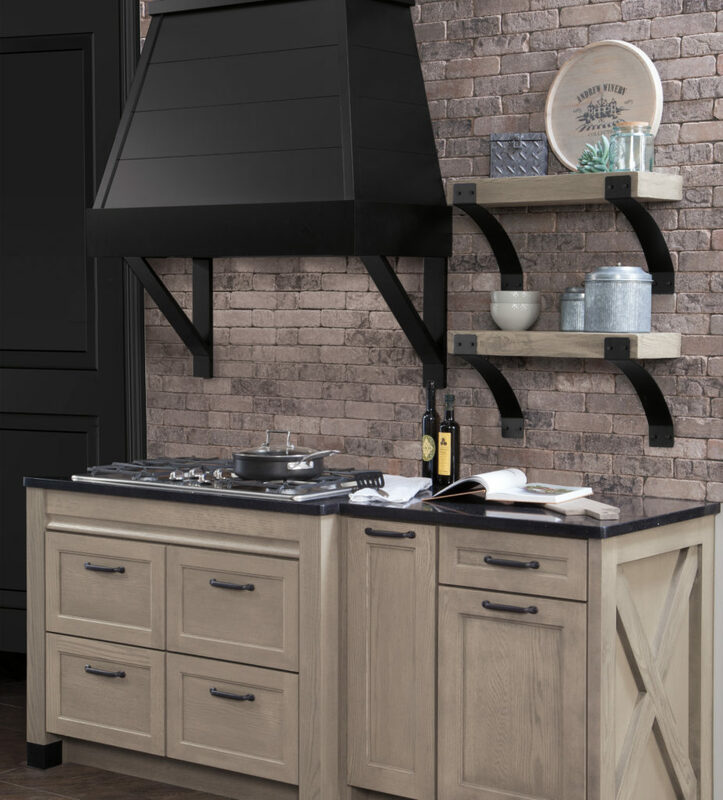 This creates versatility and the option to place the appliance in an Island, as a corner range/stove or simply against the wall without compromising your backsplash design. Shelf depth microwave – this term refers to a microwave that has a depth of 12” meaning it can fit in an upper cabinet almost anywhere within your kitchen design. Depending on your actual layout you may find that the hardest appliance to place is the microwave, this is a great option to resolve that issue. 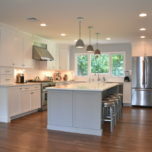 Cost Effective Kitchen Design NJ Homeowners! Whether you’re doing a small kitchen design or a large kitchen design, there is always somewhere you could be cost-effective. Relocating a sink or stove completely across the room could be more costly and just simply moving them if you feel you can either direction. Getting the look of a custom cabinet out of a semi custom cabinet used to its fullest potential. Omitting some upper cabinets to allow for an open shelf concept. Looking for remnant pieces of either granite or quartz for the countertop. These are all great ways to create a cost-effective kitchen design plan without sacrificing the functionality, integrity or overall design aesthetic. When reviewing your plans you want to look for a few things to ensure proper function of your layout. Looking at all the major pieces of your plan including the refrigerator, the sink and the range, do they all create a sense of balance and are they their own focal point? Do the cabinets in the plan all make the best available use of the space? Can smaller cabinets be combined with slightly larger cabinets to provide better functionality? You’ll also want to take into consideration whether or not the space does or could support a multi user environment, this is also known as Workstations. Using a cautious Eye you will want to look for potential hazards such as double oven too close to an entrance way where limited warning could cause a child or unsuspecting adult to walk into a hot oven door. And finally you’ll want to check the clearance and tolerance for all of the appliances and make sure that they operate correctly and do not hinder any walkways. Have a Kitchen Design question? There are many ways to do two tone kitchen cabinets in your kitchen design. More commonly you’ll see two tone kitchen cabinets where the island is one color and the main part is another color, it’s very easy to see in this design how and where to separate the colors but it gets more complicated when you are dealing with base cabinets, upper cabinets and tall cabinets that all come in contact with one another – for this type of two tone kitchen cabinets we need to make additional considerations as to where the visual brakes come into play and how the overall space and kitchen design is impacted by the two tone kitchen cabinets. Typically you want to group either upper cabinets or base cabinets together with a different color, next you’ll want to look at how the crown moldings or base moldings connect to the cabinets with the different finish and finally you’ll want to see where elements are attached to tall cabinets, like a pantry, to determine overall flow of the two tone kitchen cabinet finish. Schrock trademark cabinets offer a wide variety of two tone kitchen cabinet painted and stained finishes that pair perfectly together for an array of beautiful options. When planning your two tone kitchen cabinet layout some additional considerations will need to be made for the accompanying countertops and hardware on the two tone kitchen cabinets. Take a look at the tow tone kitchen cabinet finishes, take note to the colors and textures for each, use this information to marry the countertops to the two tone kitchen cabinets. Having one countertop in a two tone kitchen cabinet design usually works best when the two tone kitchen cabinet finishes are not highly contrasting, like two painted finishes where one is white and the other is a light grey. The option of having two countertops in a two tone kitchen cabinet design comes into play when the cabinet finishes are very distinct like a stained island and painted main cabinets. Decorative hardware for two tone kitchen cabinets can be all the same or different for each finish type, using the same type of hardware in different finishes is a nice way to pull the details together. U shaped kitchen with island refers to s kitchen that has cabinets on three walls with an island somewhere in the middle of the room where as an L shaped kitchen with island layout would have one less wall of kitchen cabinets and that opens up more possibilities as to which direction the island can face – depending on your kitchen cabinet layout you may want the island to be opposite the range wall to provide more prep space or opposite the sink wall if the island is to be used for seating and housing other necessary kitchen appliance like a built in wine fridge or microwave drawer. One extreme could be that you have so much space you decide to have a Kitchen with two islands. Having a Kitchen with 2 islands creates many opportunities for interesting arrangements and will vary greatly for each specific application. Small kitchen with island is probably far more common and can be an excellent addition to any small kitchen design. So let’s layout for a kitchen with island, in an empty room floor plan you’ll want to measure off the walls where base cabinets are going approx 24” to create the footprint of the base cabinets. From the face of the base cabinets measure 36”out into the room to create a space for a walkway – do this in the remainder of the room and what you are left with is the available space for a kitchen with island. Want to make a really bold statement with your kitchen remodeling project? Think about White kitchen black countertops, now at first that might sound too strong and plain at the same time, what makes it interesting is the choices that the finishes are on like the white kitchen cabinet doors having a nice contour to them and the black granite countertops will have natural variation and can even have a little sparkle thanks to a little mica flecked throughout the granite. 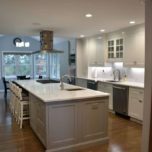 White kitchen cabinets have been popular for years now and over time more and more white kitchen cabinets colors have become available, keep this in mind when planning your kitchen, it does not have to be a stark white kitchen. Black countertops come in all varieties like black granite countertops, black quartz countertops and black concrete countertops just to name a few, plenty of options exist for a white kitchen black countertops. If you’re looking for a clean statement perhaps Grey kitchen cabinets with white countertops would be perfect for your kitchen renovation. Kitchen design trends have pushed the marble looking Quartz countertops to the forefront of the kitchen design scene since actual marble countertops are not durable enough to be used as a kitchen countertop. 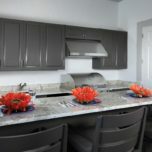 The big question of granite countertops vs quartz countertops really comes down to personal preference and sometimes costs, quartz countertops can cost more since it is sold primarily as a whole slab which means you will pay for all the waste this is rarely true for granite countertops. The best hint to do is have the kitchen cabinets plans sent to the kitchen countertop fabricator so they can provide you with an accurate kitchen countertop estimate for fabrication as well as installation so there will be no surprises later on in the project. At some point during your kitchen remodel planning you’re going to wonder how much this kitchen remodel is going to cost you, right? The cost of kitchen remodel all depends on how large or small your room is and what materials you select. 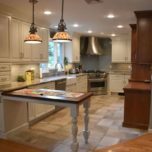 The question of how much does a kitchen remodel cost will also depend on where you live, kitchen remodeling costs in Hawthorne NJ will be very different from another state so it’s best to get a few free estimates to find out what an average cost of kitchen remodel will for your specific project. For a general guideline on what others have spent, Houzz and Home Advisor have compiled plenty of data on average kitchen remodel costs, just be prepared for when you get the actual costs to remodel your kitchen, they could vary greatly from what is reportedly being spent. 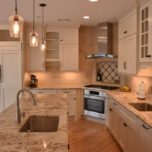 The reason this happens is because the details of what has been included and what has been excluded is not part of the reports so it’s anyone’s guess as to what the specific job details were making it impossible to find a comparable kitchen remodel to evaluate for the purpose of finding an average kitchen remodel cost. The better question to ask your kitchen remodeling contractor what their average cost is to remodel a kitchen and what’s excluded. How to clean wood kitchen cabinets with either a stained finish or a painted finish follows the same process since the kitchen cabinets are manufactured using the same process and have a final protective top coat. First it’s important to note that the painted or stained finish of your kitchen cabinets are sealed by a top coat of lacquer or conversion varnish that seals and protects them, it’s also the reason why the are so durable in the kitchen. Since that is the case using any type of product like a furniture polish will leave an oily residue on the cabinets, those products are intended more for waxed finishes and furnishings that do not have a protective coating. What is recommended is a mild soap and water solution, like a Murphy oil soap. The product comes in a concentrate which needs to be diluted in warm water or in a spray bottle ready to use, no matter which product you choose the same rule applies, make sure to use a damp cloth that is not over saturated. Applying too much water while cleaning the cabinets can cause water damage which is typically not covered under the cabinet warranty. Need more Kitchen Remodeling Design Ideas?